EU leaders are to meet for an emergency summit in Brussels to decide whether to offer the UK another delay to Brexit. Prime Minister Theresa May wants to postpone the date the UK leaves the EU beyond this Friday, until 30 June. But the EU is expected to offer a longer delay, after European Council President Donald Tusk urged the other 27 leaders to back a flexible extension of up to a year – with conditions. Mr Tusk added that “neither side should be allowed to feel humiliated”. 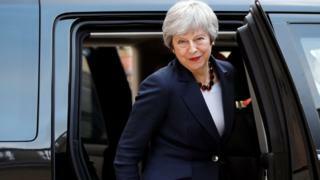 Brexit Secretary Steve Barclay said neither he nor the PM wanted to see a longer extension, but said it was a possibility because MPs had not backed Mrs May’s deal. Every EU member state needs to agree before a delay can be granted. 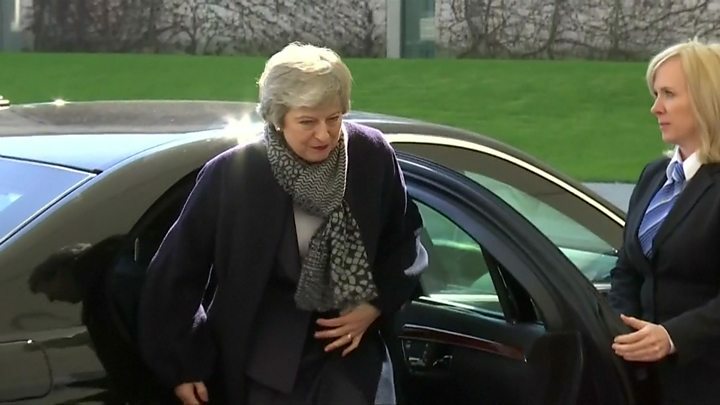 Mrs May will head to Belgium this afternoon, after her weekly clash with opposition leader Jeremy Corbyn at Prime Minister’s Questions in the House of Commons. That head-to-head follows five days of talks between the government and Labour officials aimed at breaking the Brexit impasse. At the summit – which begins at about 18:00 local time (17:00 BST) on Wednesday evening – Mrs May will formally present her case for a short delay until 30 June, with the option for the UK to leave earlier if her Brexit deal is ratified. BBC political editor Laura Kuenssberg said the PM had to convince EU leaders about the credibility of talks with Labour and prove they were “a genuine political plan that has a chance of getting the UK out of this maze”. She said the assumption a long delay would be agreed was not guaranteed, adding: “Don’t rule out a shorter extension”. In a formal letter to the leaders on the eve of the summit, Mr Tusk proposed a longer, flexible extension – although “no longer than one year” – to avoid creating more cliff-edge extensions or emergency summits in the future. Any delay should have conditions attached, he said – including that there would be no reopening of the withdrawal agreement talks. And the UK would have the option to leave earlier if a Brexit deal was ratified. Referring to Mrs May’s proposal for an extension until the end of June, he added there was “little reason to believe” that Mrs May’s deal could be ratified by then. EU officials have prepared a draft document for the leaders to discuss at the summit – with the end date of the delay left blank for them to fill in once deliberations have ended. 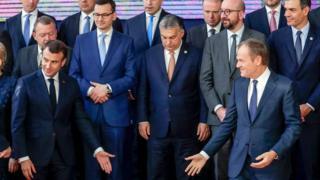 BBC Europe editor Katya Adler said the fact the length of delay had been left blank in the conclusions showed EU leaders were still divided on the issue. BBC Europe correspondent Kevin Connolly said “much has been spelled out in advance”, including the condition that if the UK remains a member of the EU at the end of May it will have to hold elections to the European Parliament or be forced to leave immediately. 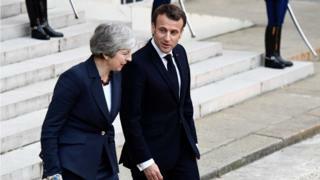 On Tuesday, Mrs May travelled to Berlin for talks with German Chancellor Angela Merkel, and then to Paris to meet French President Emmanuel Macron, in a bid to seek their support for her shorter delay. In a statement, Downing Street said the prime minister and Chancellor Merkel agreed on the importance of ensuring Britain’s orderly withdrawal. Meanwhile, talks between Labour and the Conservatives are scheduled to resume after Mrs May returns from the summit. The Brexit Secretary, Stephen Barclay, said holding talks with the opposition was “contrary to the normal tradition”, but they were taking place “in good faith”. Labour MP Jack Dromey, who has campaigned to rule out no-deal in Parliament, criticised Mrs May for taking two years to reach out to his party, but said there was a “genuine desire” on both sides to reach an agreement. “Those negotiations are tough, they will take time and there is a mountain to climb,” he added.